We’ve only done about 6km today, but it’s been really hard going over some really rough moraine. We are currently camped just before the Turner Glacier so we can get across the river first thing in the morning and we’re hoping to be up crazy early, about 4am to get across it before the river is too high. Along the way today we climbed half way up Midnight Sun Peak, which is pretty cool, we got some good views over the glacier and the moraine lake. We hoped to go up Turner this afternoon but it didn’t really happen because the weather’s completely clouded in and it’s been raining all afternoon so we didn’t get that. We were going to go and have a closer look at Mount Asgard, but unfortunately, due to the weather, we haven’t found anywhere to see it from. We worked out today as well that we’ve covered about 250km so far for the expedition. That’s double hauling at the beginning and going up the Norman Glacier, and the route’s only 97km! Ha, very funny. Tomorrow we’ll be up about 4am to get going. We hope to do maybe 15km. We need to get a move on really, so we can get our pick up at the end. It’s been pretty heavy going: we’ve been carrying nearly 25 kilos over some pretty rough terrain. So hopefully we’ll make it but we’ll see how far we get tomorrow. Hopefully we’ll actually make it to Summit Lake, but as I say, we’ll see. 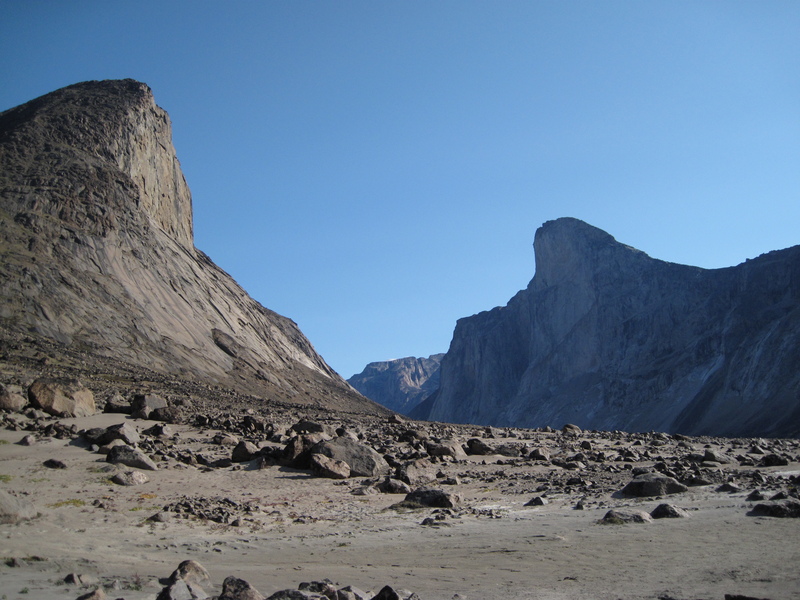 And then 3 days left and we’ll be in Pangnirtung and then back to everyone soon.